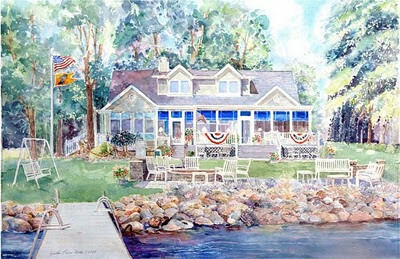 Am posting my most recent finally completed "house portrait." 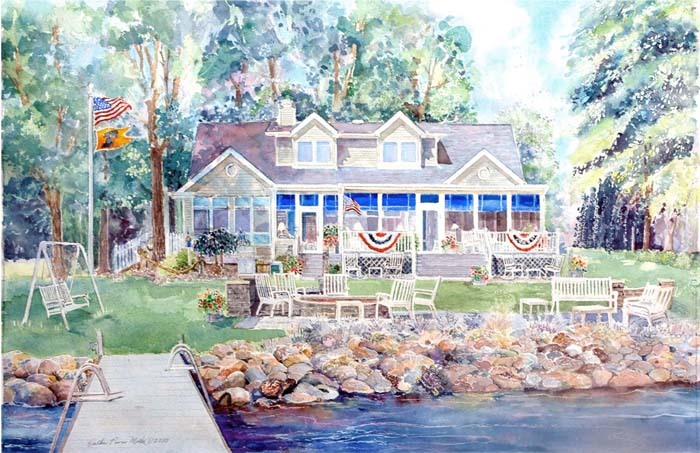 This family has many wonderful memories of time spent in this Lake Maxinkuckee cottage. The elevation from the water is ideal. Such an appealing spot with extensive porches, a yard with a large fire pit and plenty of seating for all. Welcome! The patriarch of this family is a thoughtful man who follows his dreams with action. Admirable respect for the environment is evidenced by this fieldstone sea wall that provides easy turtle access back and forth between land and lake. It was fun for me to plant two of these critters on the sea wall. I've cropped two turtles from this watercolor, and enlarged them so you can view each of them " up close." From our studio - After the huge Thanksgiving crash of the "Grandmother Christmas Cactus", the baby cacti are looking healthier each day. About a dozen of them are in glass jars, with their roots in the water and on a table in the south window of my studio where natural lighting is ideal. Today, we put away Christmas ornaments, and I worked for several hours on a snow scene of another inviting home with candles glowing in its windows - which I hope to be able to finish and photograph for the next blog. We plan to use this watercolor for our belated 2010 "holiday" card. Am sorry it is emerging late, but grateful that I'm still able to share my art with you. Ward and I thank you for your many thoughtful holiday messages, and we wish you continuing peace and joy in 2011! Winter hours: Fridays and Saturdays from 10 till 5, and whenever the open sign is out, or by appointment. Most of our prints are available on this web site. Paypal and free shipping within US.